You can increase the power of an engine by increasing its capacity. This is a fairly involved process and requires a good deal of research and preparation. Unless you want to have to retrace your steps and go a different route midway in to the job. 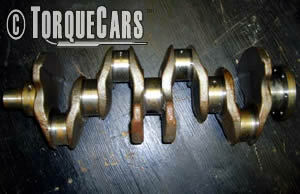 Some of TorqueCars.com members have had their engines rebored ,and this does seem a good way to increase power. However there are a few things we should take into account. The cylinders are the main part of any engine and is where compression and combustion takes place. A 1 litre engine has a cylinder capacity equal in volume to 1 litre (0.25 liters per cylinder in a 4 cylinder engine - this is filled with fuel and air). The mixture is then compressed ready for ignition and combustion within the cylinder. The ratio of compression is another key element in an engine and if it is too high you can create engine knock also known as detonation so this is another thing to factor in when increasing the cylinder capacity of an engine. Increase the cylinder capacity & Power output of your engine with a re-bore. A cylinder comprises usually a cast iron block but in some engines constructed of aluminium there is a steel liner fitted such as those pioneered by Alfa Romeo. In this article we are talking primarily of cast iron blocks as these have more scope for cylinder capacity increasing. Essentially the more you start with the bigger the power gain will be. If you have an aluminium block you may be able to fit a slightly thinner liner and your only other option would be a stroker kit which is something torquecars will cover in a future article in more detail. Drilling out the cast iron block to a wider dimension will increase the cylinder capacity. Obviously with a larger diameter cylinder you will need to match this to a larger diameter piston. While this sounds like a simple job you must drill out maintaining concentricity ensuring they are machined parallel to the crank centre line and to the same deck height. Remember to always cut a cross hatch pattern into the cylinder wall to assist with bedding in the piston rings and maintaining a good compression ratio. Do not attempt to do a rebore yourself with a mill as you will not get a good enough finish - it will create chatter marks whereas a proper jig borer will be accurate to within a thousandth and then finished with a precise honing. Blocks are often similar 1600,1800 and even 2000 engines have the same block but the internal cylinder dimension is different. In the case of these engines a rebore to a larger size and the fitting of pistons from the larger sized engine will effectively increase the engine cylinder capacity. In some rare cases the only difference between the larger sized engine is the shape, size and profile of the pistons. After the cylinder rebore get the chamber volume measurements and machine the heads to balance these as well removing any material necessary to get the Compression Ratio right. Don't be surprised if you can't get pistons to match your chosen rebore dimension if you have not done the research first. A proper machine shop will tell you what cylinder dimensions work best with which piston and they will also take stress tests to determine the maximum amount or reboring that the block can handle. The other way of increasing the engine size is by using a stroker kit. The crank in a stroker kit allows a much longer stroke in the engine thereby increasing the cylinder capacity. (A lower compression piston will also increase the combustion chamber at TDC, but needs other modification for there to be a power gain.) Common kits increase the 2.0 Subaru or skyline engine to 2.5 litres. Combining a stroker kit with a rebore will maximise the power increase available if done properly. If your engine suffers from a scored cylinder and is suffering from low compression you may look at reboring the engine and while you are at it you may just as well bore it out to a greater capacity and fit new pistons to match the larger bore. When stripping down an engine always replace the cylinder head bolts and rod bolts. There is no need to replace the main bearing cap bolts with new ones. It is also worth replacing the core plugs (which pop out when the engine freezes). When you have the engine out of the car you should take the opportunity to replace these with new parts. (When engines are left without coolant and engine oil for more than a few days corrosion can be a real problem). Even when buying an engine from a scrap yard or doing an engine swap TorqueCars would recommend stripping it down first, replacing worn parts, and rebuilding it to save problems later on. At least replace the core plugs, the head gasket and cylinder head bolts and while these are off you get an opportunity to inspect the engine for damage and can decide in advance whether a rebore, re machined crank and new pistons would be cost effective - for the extra cost involved you will save yourself a great deal of hassle later on when the engine breaks down. With a stripped down engine you have a fantastic opportunity for tuning and can save a small fortune if you get all of the engine modifications done at the same time so look into engine balancing, fitting larger valves, gas flowed machined head, crank lightening and even a lighter flywheel and clutch as most of these will involve a great deal of man hours stripping and rebuilding the engine again. Why not join us in the forum to discuss all aspects of car tuning with our resident experts and enthusiasts? This entry was filed under Engine Mods, Tuning. You can leave a response below or join our forum to discuss this article and car modification in detail with our members. hi when you swap engine block aluminium with your head cylinder for the same brand and type of car you need to re bore the block again? Running in only takes less than 50 miles IF dome properly and the only thing that needs RI is the rings as they are the only things in a motor that have metal to metal contact. Suggest that you read motormans running in secrets.